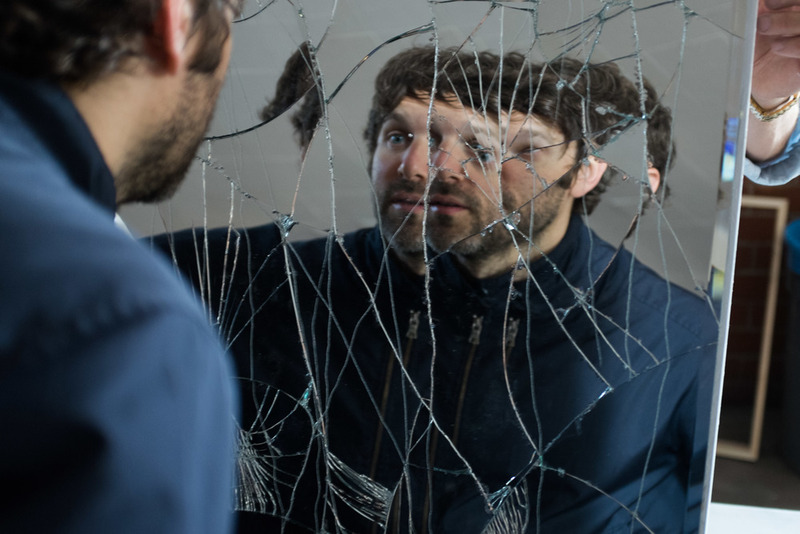 In the story there is a “chamber” that leads our protagonist on a journey through his own mind revisiting his past, augmenting the now and foreseeing the future. The chamber does this through a series of thought reactive hypnotic light patterns. As the chamber guides his mind with colors and pulses, his visions mimic those colors and moods. The story is based on several signature images that GMUNK imagined. In that way the film may be abstractly autobiographical to him. These images were referenced with photos that we found on the internet. We compiled them into a huge pinterest board for reference and inspiration. We took that reference board and built a very detailed storyboard and shot list from it. Most of the scenes were pre-visualized in Maya. Through that process we were able to plan details of the character placement, camera path, lensing, lighting, location and set requirements, prop construction and even editorial style. Meanwhile Keith Ruggiero (soundsred.net) and GMUNK were crafting out the score. We were listening to it develop as we were prevising. Because there was not dialogue to take cue from, having the music at that stage was very helpful to crafting the cinematic tones in harmony. Excepting two key shot the film was shot without the need of post VFX. It was a classic process of shoot, edit, color grade and conform. The intro hallway scene is meant to build tension. The act of waiting inline does that simply it’s self, but then there is a wild lighting environment and at the head of the line, a mysterious space that spills shards of frenzied light and mesmerizing laser patterns. We built two counteracting lighting environment. The chamber light at the end of the hall and the hallway lighting counterbalanced each other. When something startling happened in the chamber the hall lighting would cascade and swell in a manner intended to sooth the cued participants. The result was a confusingly tense lighting environment. It was unsettling to the participants, triggering conflicting thoughts. They were sweaty with heavy breath, that was easy for them because the hall was well over 100 degrees fahrenheit. The hallway was built out on a location, ironically an old correctional facility. It was painted completely black, the house lighting was removed. At the end of the hall was an exit door. We had that tented with black out to block the daylight and create a controlled space to simulate the chambers lighting. The hot LA sun quickly turned the tent into a oven perfect for the characters motivation. Also, we had the wall sprayed down with water to enhance the dank dense feeling and to add a little sparkle. “Cowboy” Shane Salyards our fearless gaffer, sourced about 72 vintage Lunestra tungsten filament fixtures. He and his team rigged those to the ceiling and wired them individually to a dimmer rack at lighting speed. This is an fantastic fixture choice to counter the immediacy of the modern LED’s that are the walls of the chamber. Lunestra’s have a very long single filament, they bruns slow and warm. They have a beautifully organic strike and decay rate. 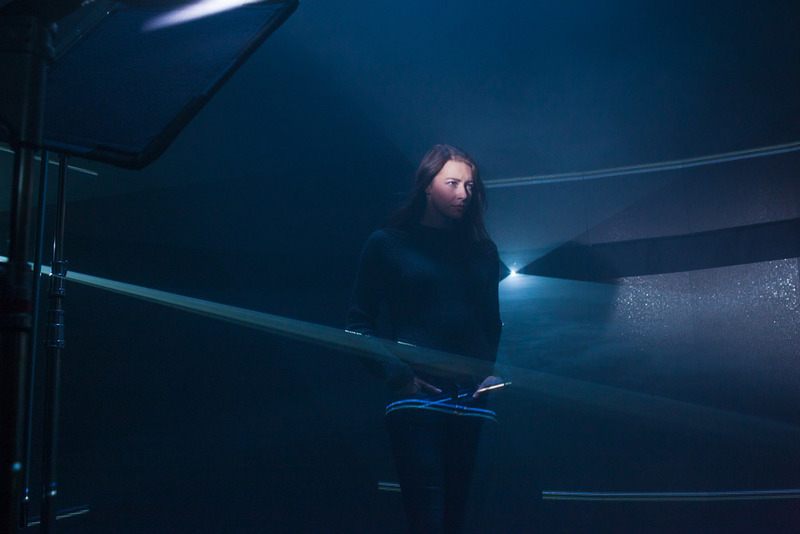 This lighting array created the soft moving practical light that distorts the characters features and guides them to their time in the chamber. Michael Fullman brought the laser and lighting control. He was able to plug into the dimmers and create the cascading patterns with a hybrid of tools including generative video patterns. 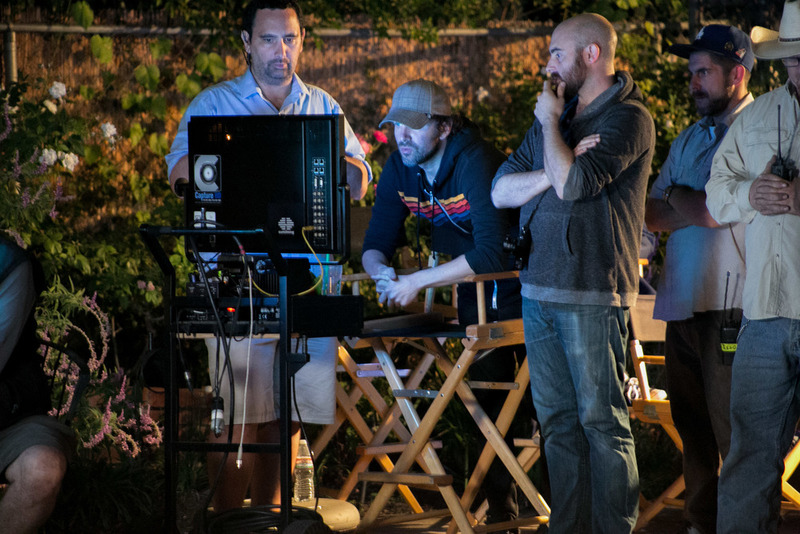 The whole scene was shot from a single dolly track setup. The Chamber was built out of over 200 7mm LED Panels, 4 projectors, and two 10 watt full color lasers. All of the LED Panels were directly controlled by a single video source that we had endless amounts of live control over. In the physical build it was an incredibly heavy structure. The entire thing was supported on chain motors from steel beams. To get the desired curve of the 16' in diameter chamber. We plasma cut and rolled custom steel brackets that held each panel in the desired curve. All of the panels in the chamber are direct video surfaces with a resolution of 64x64 pixels. The entire chamber itself was a resolution of 1920X396, wrapping around the entire circumference and really placing our principal right in the center of the video environment. The Projectors were all controlled via. separate video feeds from a media server that allowed us to change the content easily and control each projector individually. All of the projectors were cross focused through the center of the chamber to really focus on hitting our principal while centered inside. In addition they were used more as beam instruments, we projected high contrast black and white minimal design to really punch through the atmosphere. All three of the different elements were all controlled together live in repeatable manners so shots could be replicated and practiced. We added a single cinema fixture to the chamber. We rigged a prototype of the creamsource sky in the center above the protagonist. We were able to dial in the color and intensity of it to match the color of the LED wall precisely over DMX. Once we got into the chamber we shoot the scene out from a 360 circular dolly track. Being on the same curved path as the structure itself really embeded the audience into the protagonist interaction with the chamber. It also created a ton of opportunity for graceful camera movement inside of the tight space. The orphanage is a flashback to the protagonist childhood and perhaps the precursor to the chamber procedures. It was important that this felt more like a dream than an actual place. We took it to a moon light interior. Arne Knudson and his team built the beds with translucent materials and placed child mannequins on them. while Michael Fullman had their innards strung up with DMX controllable LED ribbon. The result was basically eight controllable light boxes with what look like a si-fi incubation bed for children. An “easter egg” at the back of the orphanage in a small room, an out of signal terrestrial TV on the floor may be foreshadowing the chambers light. 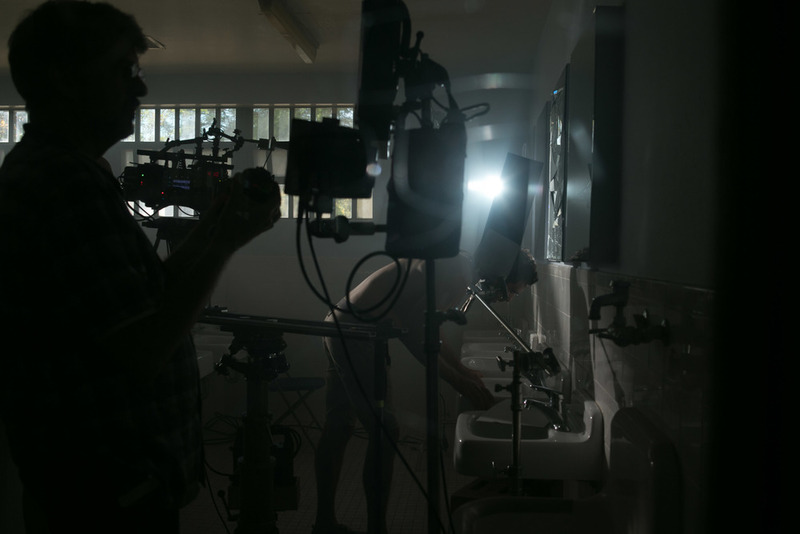 The bathroom scene is a an introspective moment of reflection for the protagonist. He has a moment to calm and collect his thought. The water from washing his face bridges a transition from the underwater scene beforehand. 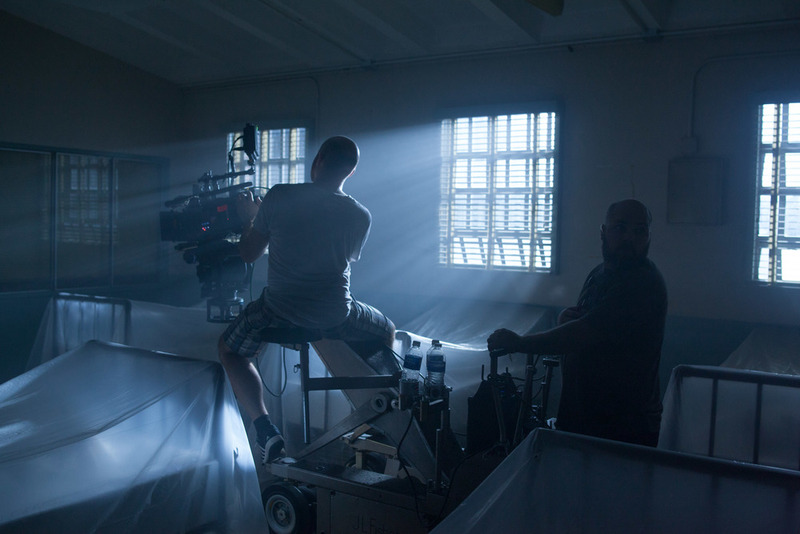 This was the only daylit scene, we streamed in a crisp and cool hard light into a hazy white room. The result is fairly monochromatic and tranquil. 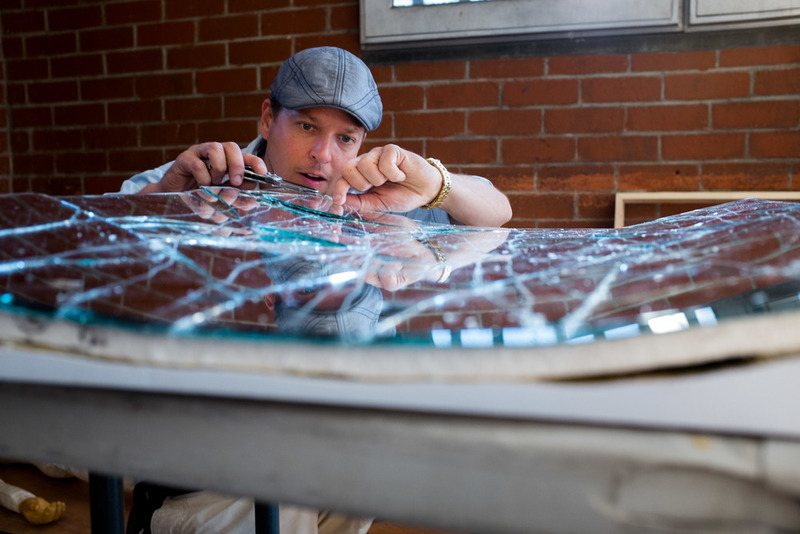 Arne Knudson expertly created the broken mirror perfectly to reflect the character's gaze several times onto himself. This thematically echos the array of beds in the orphanage and the multiplicity in the final scene. Our friends at spypost tracked in golden glint into the eyes of the multiplied reflections. It seems that the protagonist is starting to understand his journey. The underwater world is like an ethereal representation of the intermingling story lines. It was important that it felt like an otherworld. It couldn’t feel like a body of water. Our location scout found the perfect pool for us. It has no flat walls or corners and it is lined with a light brown pebbly sand texture. Perfect! Light was key in transforming the pool to an otherworld. We wanted to keep the walls dark but have soft light that did not create iconic water caustics. 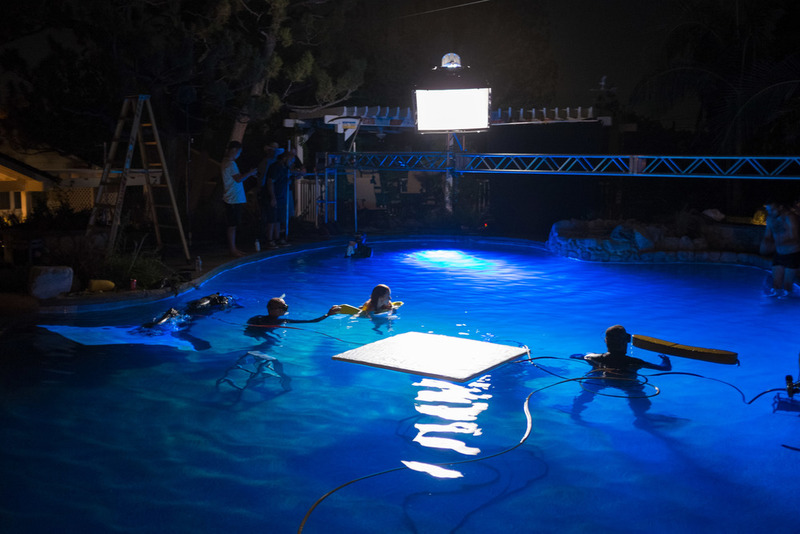 For this key light was spanned the pool with a box truss and rigged a large chimera from it. To control the falloff we had a very tight metal grid on the chimera. For the “love scene” when the woman descends to great the man, we wanted to add more mood. At this point in the shoot the water was starting to get cloudy from all the action. It was like a smoky room, perfect for volumetric god light. We put a him par in the far corner of the pool with a wonderful orange red gel that Cowboy Shane had in his kit. Instant love. 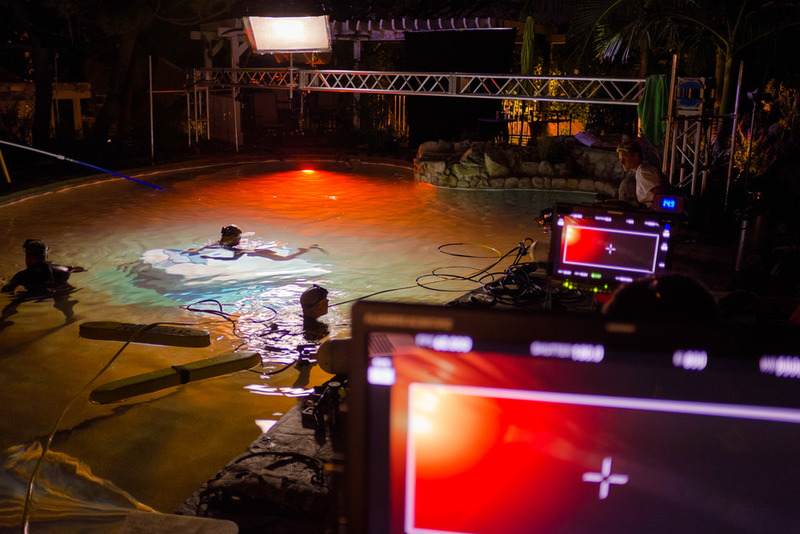 We shot that scene with the elexa in a hydroflex with a cabrio zoom. 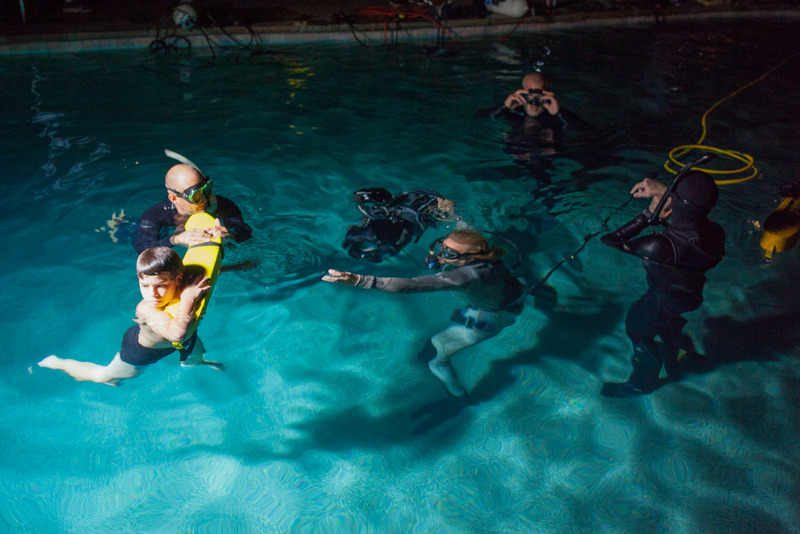 We had a fabulous team of underwater camera and light technicians. Everything went just swimmingly. As the protagonist leaves the chamber, things are calm yet odd, there is a feeling of exhaustion and confusion. He walks with his head down past the others waiting to enter. Slowly we start to reveal the others waiting, we cut to hi POV and can now see that all them people waiting are him, till eventually standing in line is the woman, they instantly locks eyes to conclude the film. 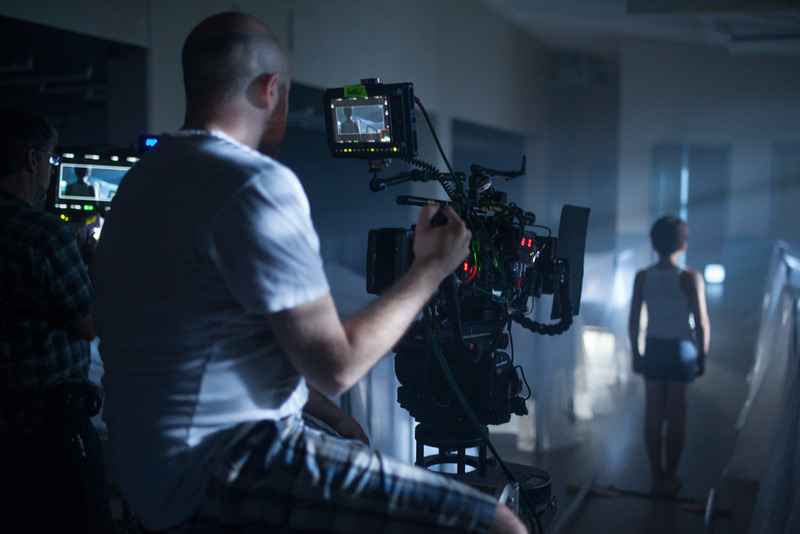 To shoot the multiplicity shots we used a hotgears motion control slider with a pan tilt head. 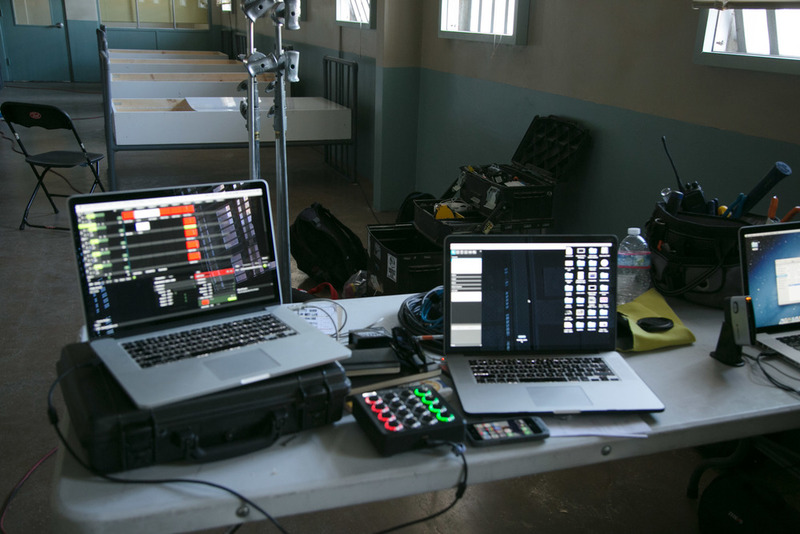 We staged the shot with all the extras, performed and recorded the camera move live with the hotgears controller and then were able to precisely repeat the camera path many times until we had captured the actor at each position in line. We took the selects to our friends at spypost where they rotoscoped and composited the material so it felt like one continuous impossible shot.